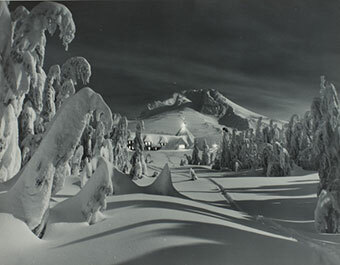 Photo: Ray Atkeson (American, 1907-1990), Mount Hood, Timberline Lodge, Moonlight, c. 1950. Gelatin silver print. Gift of Virginia Nelson. © The Ray Atkeson Image Archive. Throughout the history of photography, practitioners have been drawn to the varying characteristics of natural and artificial light, skillfully using them to express mood and underline emotion. Dusk through Dawn showcases more than 70 pictures made in the hours between twilight and daybreak, when light becomes particularly suggestive. From scenes of nocturnal activities exposed by the harsh flare of the camera’s flash to early morning landscapes awash in subtle, atmospheric tones, these images are among photography’s most striking.